Mylan CEO Heather Bresch insisted Wednesday that the outrage swirling around her company's decision to dramatically hike the cost of its EpiPen has been overblown. Bresch said the company's profit on its $609 EipPen two-packs is about $50 per pen. She also indicated Mylan (MYL) has no plan to lower its price for EpiPens. Her defense of Mylan's pricing unleashed a barrage of comments from lawmakers, including one who said, "We don't believe you." Members of the House Oversight Committee spent hours telling Bresch that the cost of an EpiPen two-pack -- about $500 more today then when Mylan bought rights to sell the device in 2007 -- was "sickening." Also damning, they said, were the hundreds of millions of dollars pocketed by Mylan's top five executives in recent years. "Yet another drug company, Mylan, has jacked up the price of a lifesaving product for no discernible reason," Elijah Cummings, a Democrat from Maryland, told Bresch as the hearing opened. He said it was happening so the company could get "filthy rich at the expense of our constituents." 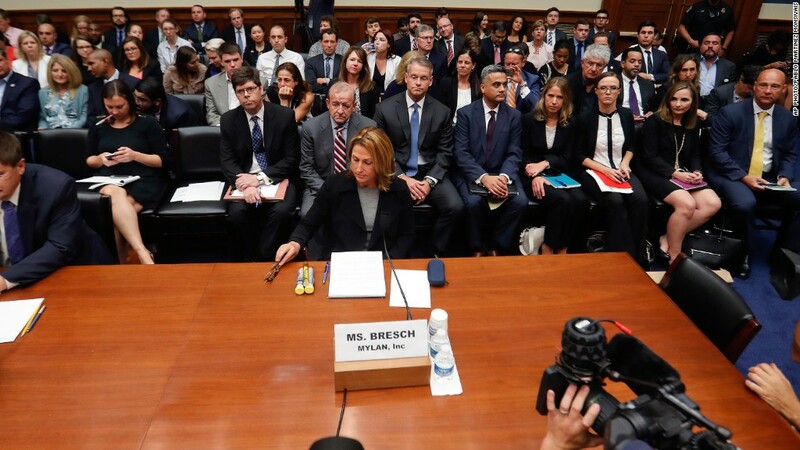 Bresch said the company has tried to make amends by offering $300 savings cards for patients who have to pay full price, and said Mylan "listened and focused on this issue and came up with a sustainable solution." But when asked if Mylan would cut the cost of its best-selling product, Bresch indicated it wouldn't. She instead suggested a planned generic version the company will market at $300. Jason Chaffetz, a Republican from Utah, suggested a generic version would actually make more for Mylan because the company plans to sell it directly to customers. "This is why we don't believe you," Chaffetz said. Committee members turned to the FDA for information about any alternatives to the EpiPen, which has a near-monopoly in its market. But Douglas Throckmorton, the FDA's deputy director for regulatory programs, wouldn't comment about pending applications the department is reviewing. That left many lawmakers visibly frustrated. "It's too hard to get new products approved in this country," said Representative Mick Mulvaney, a Republican from South Carolina. Bresch was also widely criticized by the committee for her own compensation. Public filings show she's doubled her income from $9 million when she took over as CEO in 2012 to $18 million last year. But she insisted that Mylan's gains haven't been outrageous, and told the committee her payout was "in the middle" of what her industry peers make. A review of Mylan profits by David Maris, a pharmaceutical analyst at Wells Fargo, shows that the unit that markets EpiPen increased its operating profit margin from 8.8% in 2008 to 60.3% in 2016. The EpiPen's price was hiked 16 times during that time. The treatment is also at the center of several antitrust investigations related to Mylan's school distribution program.